UK consumer prices inflation held steady at 2.7% in December, official figures have shown. 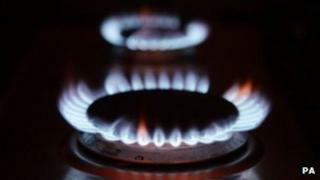 A rise in electricity and gas prices was offset somewhat by a fall in fuel costs and air transport, the Office for National Statistics (ONS) said. The CPI rate of inflation has been above the Bank of England's 2% target since November 2009. Retail prices index (RPI) inflation, which includes housing costs, edged up to 3.1% last month from 3% in November. The figures were broadly in line with analysts' expectations. It was the third month in a row that the CPI rate has come in at 2.7%. Phil Gooding from the ONS told the BBC: "By far the largest upward effect comes from domestic gas and electricity. Here we saw the majority of the pre-announced price increases coming into the index for December." Electricity prices were up 3.9% compared with December 2011, while gas prices were 5.2% higher. Prices of food and non-alcoholic drinks rose 3.8%. However, motor fuel costs fell 0.2% while air transport dropped by 6.8%. Sarah Hewin, head of research at Standard Chartered, told the BBC that she was optimistic that the rate of inflation would start to fall. "The outlook I think is probably for inflation falling, rather than inflation rising," she said. "Unfortunately the backdrop is that the economy is continuing to struggle. We've had some pretty poor data out recently and that in turn will dampen inflation pressures." However, John Longworth, director general of the British Chambers of Commerce, said he expected inflation to rise in the near term, as further rises in utility and food prices kicked in. "Higher inflation is clearly a concern for the UK economy as it increases the squeeze on both businesses and consumers, further exacerbating an already weak economic environment," he said. TUC general secretary Frances O'Grady called for "healthier pay rises". "Unless inflation falls are matched by stronger pay growth, 2013 will be the fourth year in a row that people have suffered real wage cuts," she said. A Treasury spokeswoman pointed out that inflation was nearly half of its 5.2% peak and that the government had taken action to help households with the cost of living, including a further increase in the tax-free personal allowance and cancelling the fuel duty increase that was planned for this month.